One of the interesting aspects of travel is that often what you think is true turns out to be slightly different. 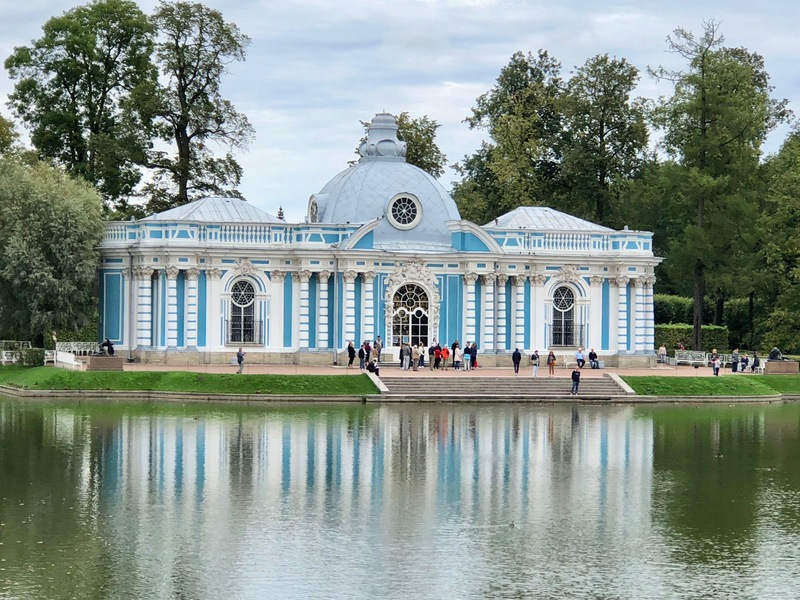 The complex I’d always thought of as Catherine’s Summer Palace never had that name. 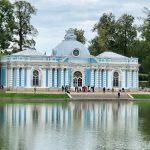 Officially the structure was called the Great Palace of Tsarskoye Selo until 1910, after which it was called simply The Catherine Palace. 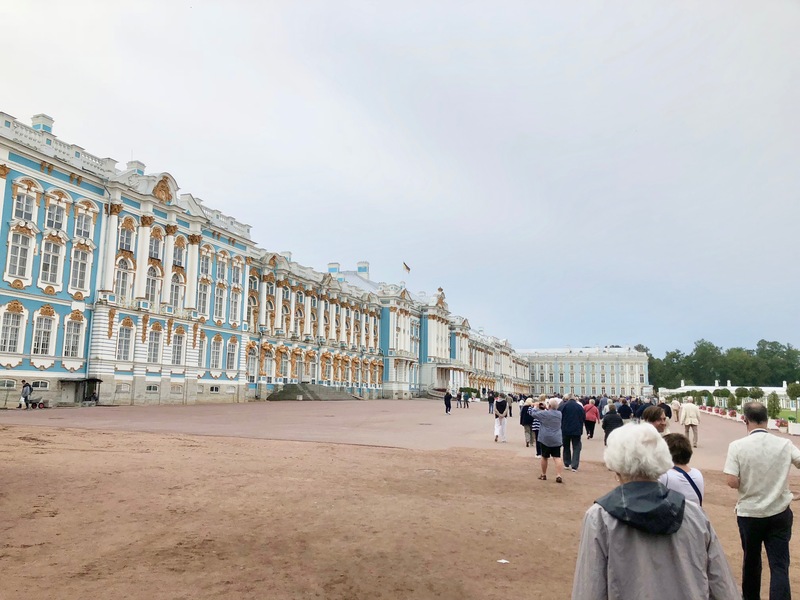 I also thought the palace was named after Catherine the Great, and her presence there is a strong one. 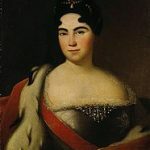 But The Catherine Palace is named after Catherine I, Peter the Great’s second wife. It is said that while Peter was putting the finishing touches on Peterhof, Catherine announced she wanted her own palace. 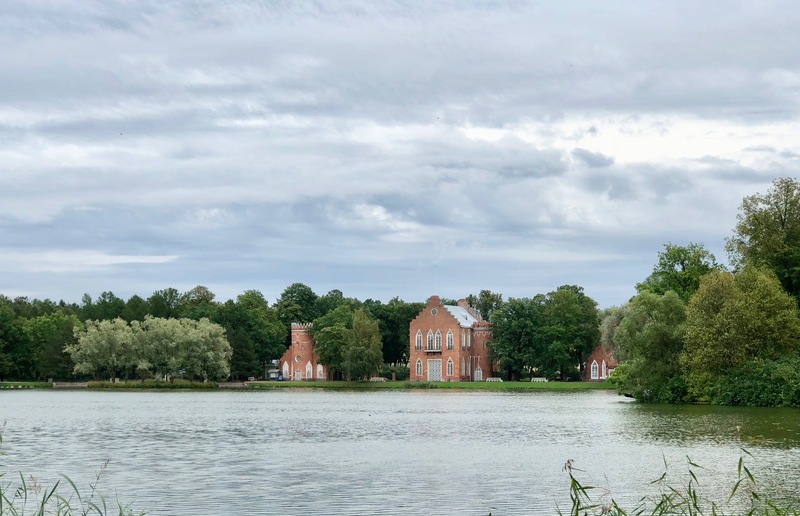 And that Peter granted her the site, presently near the town of Pushkin, so that she wouldn’t become a landless widow. 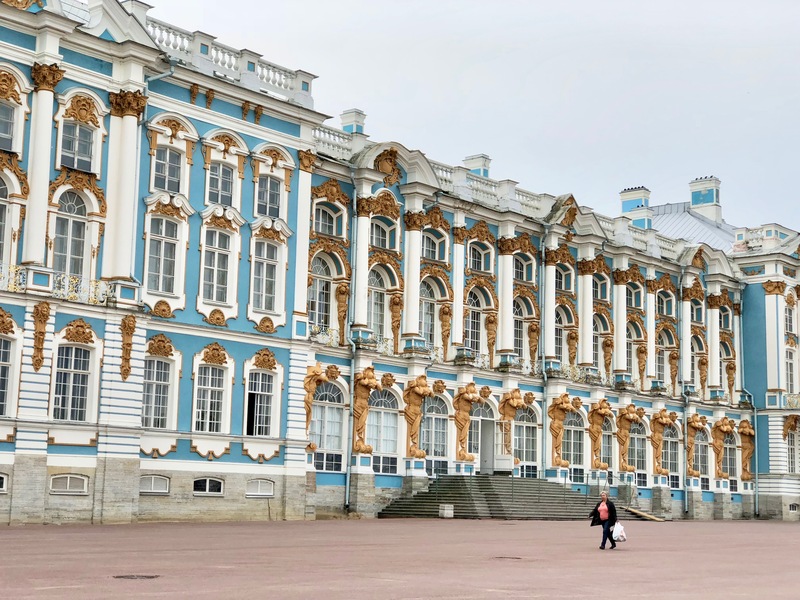 Catherine I began constructing her palace in 1717. 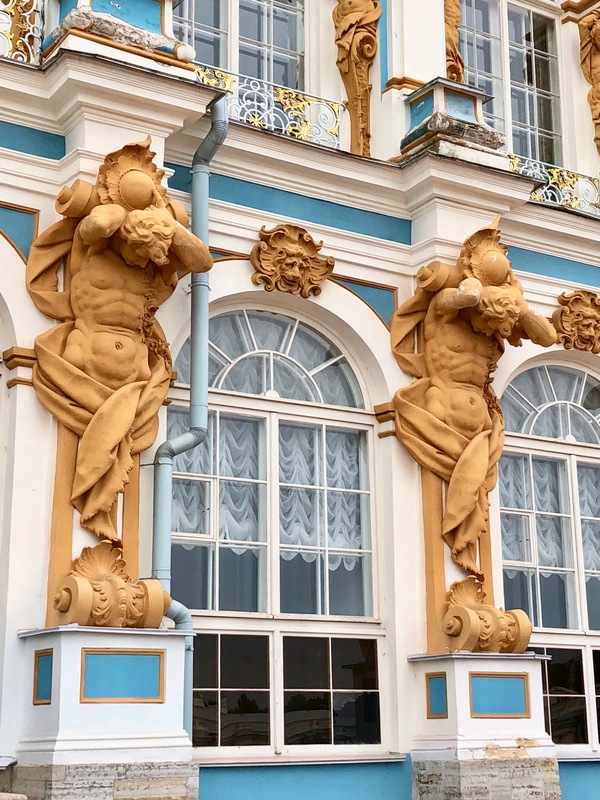 Peter the Great’s successor, Empress Elizabeth, demolished the structure twenty-five years later, and replaced it with the present rococo building. 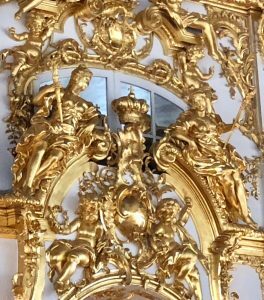 Over 100 kilometers of gold gilds the stucco facade. The blue, gold and white facade is over 300 meters long. In the 1770s Catherine the Great made her indelible mark on the palace. 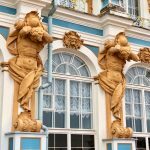 She wanted to replace the rococo design with a Neo-Palladian style, and have her own apartments done in the Greek Revival style. 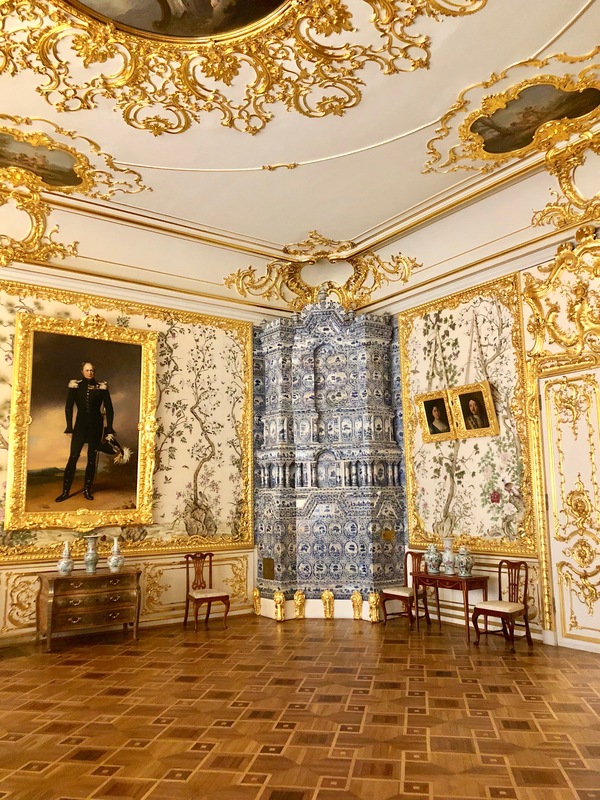 However, Catherine accepted the recommendation that she keep the gilded rococo decorations in the public areas, because it would impress foreign dignitaries, as it continues to impress visitors today. 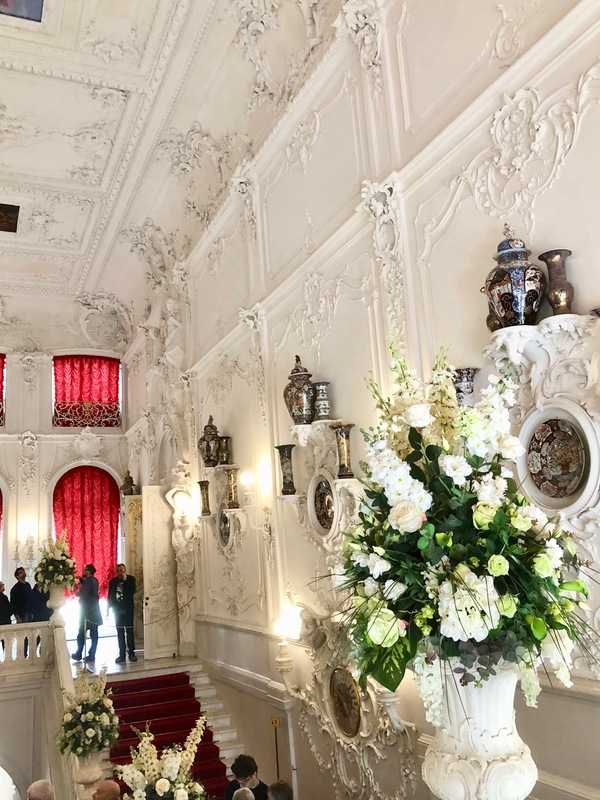 One enters the building via the Grand Staircase completed in 1863, but retaining the rococo style. The Great Hall, done in baroque style, opens off the staircase. 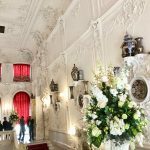 Its 800 square meters was designed for official receptions, banquets, and balls. The effect is breathtaking. 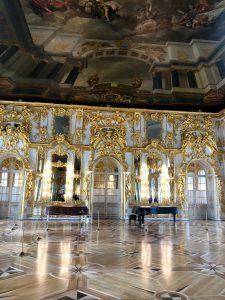 The Great Hall with its gilded woodcarvings and thousands of mirrors was Empress Elizabeth’s preferred setting for her twin avocations of seducing men and spending money. 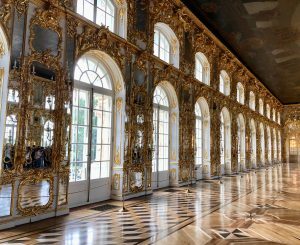 From the Great Hall, the palace opens into a series of rooms featuring lapis lazuli, jasper, malachite and other priceless artifacts. Originally, the palace had 58 halls. Since World War II, 32 have been restored. 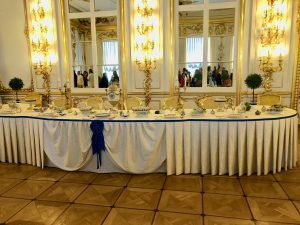 After the Great Hall, the next room is the Chevalier Dining Room featuring porcelain dishes called Order Services with the badges and sashes pertaining to the former Russian aristocracy. The White State Dining Room further on was used for banquets and smaller evening meals. The private apartments begin with what is called the Small White Dining Room, though the dining table isn’t presently seen. 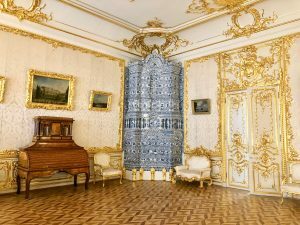 The second private apartment is the Chinese Drawing Room of Tsar Alexander I dominated by his portrait. The walls are painted in watercolors inspired by Chinese designs. Leaving the palace, visitors can wander through THE CATHERINE PARK. 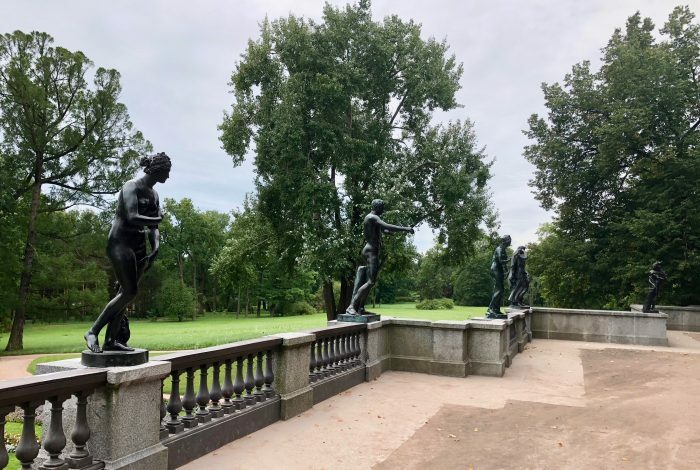 Among the features is the Old Garden which Peter the Great may have designed in the Dutch style. But Catherine II wanted to show Europe a modern 17th century garden, and monuments to her rule. The landscaped park includes the Great Pond surrounded many smaller structures. 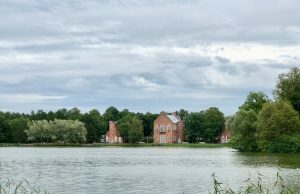 The brick buildings known as THE ADMIRALTY once stored boats for excursions across the Great Pond. 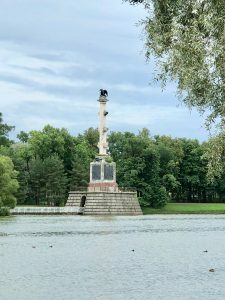 The TURKISH BATH and the CHESME COLUMN both commemorated Russian victories in the Russo-Turkish War. 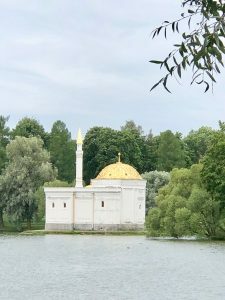 The GROTTO PAVILION on the edge of the Great Pond features incredible acoustics. During our visit an all-men’s chorus sang a capella before offering copies of their CD for sale. Visiting The Catherine Palace is an experience of sensory overload. Not only because the sheer opulence is exhausting, but also because of the crowds inside the palace. There’s no stopping for a longer look as visitors surge forward for a better photographic look. 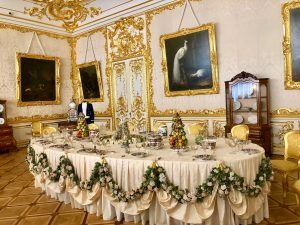 But underneath the crowded floor and noisy chatter, it’s still possible to glimpse a moment in history when a very few lived opulently, supported by people who didn’t share the wealth. 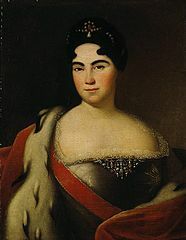 Portrait of Catherine I, Public Domain.